The game has gained a tremendous level of polish in the last couple of weeks. 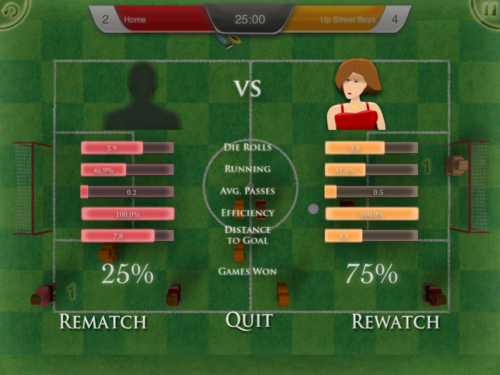 After a match, there are now some basic statistics and a direct way to have a re-match or re-watch the game. There are two new, easier AI characters: one that plays like a novice player and one that plays completely defensive (it even get’s challenging to reach the ball at all). I’m not sure how much work on the in-game 3D assets will be done before submitting the app. Probably a lot has to happen with the first update just to finally get the app out! The plan is to send new test builds to beta testers later today, paint the missing AI character images and then call it quits … for now! I’ve already got like 70 tickets full of ideas and improvements for future updates.